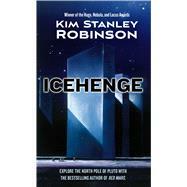 An early novel from Science Fiction legend Kim Stanley Robinson, now available for the first time in decades: Icehenge. On the North Pole of Pluto there stands an enigma: a huge circle of standing blocks of ice, built on the pattern of Earth's Stonehenge--but ten times the size, standing alone at the farthest reaches of the Solar System. What is it? Who came there to build it? The secret lies, perhaps, in the chaotic decades of the Martian Revolution, in the lost memories of those who have lived for centuries. New York Times bestselling author KIM STANLEY ROBINSON was born in 1952. A native Californian, he is the author of the Nebula and Hugo Award-winning Mars trilogy, as well as the 2016 winner of the Robert A. Heinlein Award bestowed for outstanding published works in science fiction and technical writings that inspire the human exploration of space. This award is in recognition of Mr. Robinson’s body of work including more than fifteen novels, including his groundbreaking Mars novels, and over forty short stories.